Tickets: $25/$20 for Siskiyou Institute Members. This performance will sell out! Advance Reservations are highly recommended. 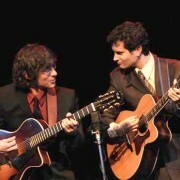 The Siskiyou Institute is please to present the amazing guitar duo featuring Frank Vignola & Vinny Raniolo. These guys are jaw dropping guitarists and you have to see them to believe them! They recently performed live on SOPTV for the pledge drive and this show is a guaranteed sell-out so make your reservations early! Frank Vignola is one of the most extraordinary guitarists performing before the public today. His stunning virtuosity has made him the guitarist of choice for many of the world¹s top musicians, including Ringo Starr, Madonna, Donald Fagen, Wynton Marsalis, Tommy Emmanuel, the Boston Pops, the New York Pops, and guitar legend Les Paul, who named Vignola to his “Five Most Admired Guitar List” for the Wall Street Journal. Vignola¹s jaw-dropping technique explains why the New York Times deemed him “one of the brightest stars of the guitar”. Born on suburban Long Island on December 30, 1965, Vignola was raised in the New York area. The Italian-American started playing the guitar at the age of six and grew up admiring a variety of guitarists. Far from a jazz snob, Vignola never listened to jazz exclusively and was also a major fan of classical, rock, R&B, and pop. The guitarists that he admires range from Django and Les Paul to rock icons like Frank Zappa and Eddie Van Halen. As a young adult, Vignola studied at the Cultural Arts Center of Long Island and went on to enjoy an enormous amount of sideman gigs in the 1980s including recording and touring with the likes of Madonna, Leon Redbone, Ringo Starr as well as coming into his own as a leader in 1988 with his famed Hot Club of France tribute which was hailed in the NY Times as one of the top ten acts in New York City in 1988 and forged the way for the many Django Hot Club groups that followed. The New Yorker was 27 when, in 1993, he signed with Concord Jazz and recorded his first Concord session as a leader, Appel Direct. Many more Concord releases followed in the 1990s as well as 3 releases for the Telarc label as co-leader of the group Travelin’ Light. The early 2000’s found Vignola recording a solo guitar CD for Acoustic Disc as well as performing regularly with guitarist, Les Paul. This also marked the time that Frank began working with record producer Joel Dorn as well as making featured appearances on Atlantic, Sony and Warner Brothers Records with the likes of Donald Fagen, Queen Latifah, Mark O Connor and Wynton Marsalis. He also recorded a collection of Gershwin pieces for Mel Bay Records titled, “Vignola Plays Gershwin” which was number 2 in NPR radio airplay charts. In recent years, Vignola has recorded two important collaborative CD’s, “Just Between Frets” with Tommy Emmanuel on Solid Air Records and “Frank-N-Dawg, Melody Monsters” with mandolinist David Grisman on Acoustic Disc Records. Frank has written 18 guitar instruction books for Mel Bay Publications and has recorded 6 Educational DVD’s for Truefire.com. He has performed hundreds of clinics and masterclasses at major universities and colleges throughout the world including Julliard and Boston University. Currently, Vignola is touring world wide. Even though his career in music is only at the beginning, Vinny has already had many opportunities that take most players a lifetime to achieve. Now playing guitar along side many of the finest musicians in the world, he is very excited to see where his music career will take him. At age 26, Vinny has already toured the United States, many Caribbean islands, Europe and Asia many times and performed at some of the top venues in the world with his music. Vinny is very dedicated to his career as a professional touring musician, studio musician, educator and arranger. Beginning to play guitar at age 13, Vinny has already experienced a very diverse in his 13 years of playing music. After performing his first gigs at the age of 16 in local jazz clubs, rock n¹ roll bars, and musical theatre pit bands he began to catch the ears of other professional musicians and began to tour and work in recording studio. Vinny has been on numerous recordings with Frank Vignola, Bucky Pizzarelli, Tommy Emmanuel, Tony Trishka, Matt Flinner and Ken Peplowski, to name a few. Vinny is also an experienced educator and has taught classes at Bowling Green University, Kent State University, Asiago Music Conservatory and others. He has also worked for many educational companies such as Mel Bay and Truefire.com. Vinny now tours the world with jazz guitar great, Frank Vignola and guitar virtuoso from Austrailia, Tommy Emmanuel. Vinny also works with many singer songwriters to arrange, record and produce their music. Tickets: $20/$15 for Siskiyou Institute Members. 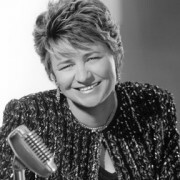 Join us for an evening of jazz with vocalist Leslie Kendall along with Ed Dunsavage, Joe Cohoon & Chicken Hirsh on the Patio (weather permitting) at Paschal Winery. The evening will feature favorite classic jazz standards from the Great American Songbook. Pack a picnic and enjoy the sunset with a glass of wine. 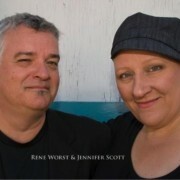 The Siskiyou Institute welcomes back two of Western Canada’s finest jazz musicians, Jennifer Scott & Rene Worst. This performance will help raise funds for the Siskiyou Institute Artists-In-Schools Program. 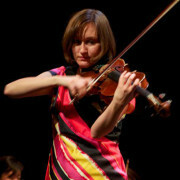 For this performance, East West Virtuosi members, violinist Heather Braun, Kimberly Fitch, viola, and David Gerstein, cello will be joined by the Music Director/Conductor of the Rogue Valley Symphony, Martin Majkut, on piano, and pianist Matt Goodrich, who currently is appearing on stage as half of the keyboard orchestra in the Oregon Shakespeare Festival’s “My Fair Lady”. The two pianists will present Antonin Dvorak¹s festive Slavonic Dances as they were originally written for piano four-hands. The program will follow the theme of folk music and dance in a classical setting with John Novacek¹s “Rags (2009)” for String Quartet. Commissioned by the Ying Quartet, these works celebrate music unique to American culture. Geoffrey Robson, violinist and Associate Conductor of the Arkansas Symphony, will join the string players to complete the string quartet. Johannes Brahms’ Piano Quartet in G minor will compose the second half of the program, ending our evening with the rousing 4th Mvt subtitled “Rondo alla zingarese” or “in Gypsy Style”. 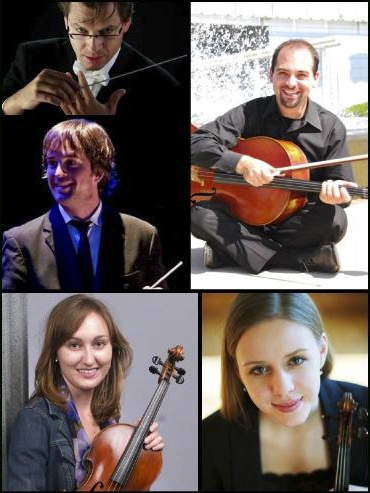 The East-West Virtuosi is a group of flexible instrumentation, which seeks to produce spontaneity in performance and give a breath of fresh air to the classical music world. The core musicians, violinist Heather Braun, Kimberly Fitch, viola, and David Gerstein, cello, met at the Eastman School of Music in Rochester, NY, and continue to perform together despite their demanding individual careers. The summer months are a perfect occasion to share their mission for presenting classical favorites alongside contemporary works in comfortable and intimate settings. The East-West Virtuosi fosters collaboration between their core members and outstanding local musicians.